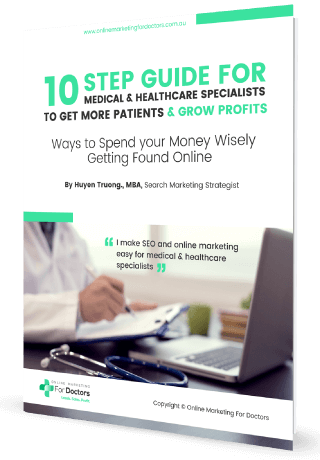 Online Marketing For Doctors have lowered our marketing budget and we’re getting much better conversion, which is a big difference between working with them and other SEOs. They didn’t change the whole website but they organized the website in a way which is easier for the clients to go through and I think that helped to improve the time clients spend on the website, which reflects on the ranking and reflects on the performance of the website. We found that we are spending almost one fourth of our previous budget and getting double the conversions which is great deal to achieve in a short period of time. Later in 2013, after the major Google Penguin update, the original domain www.chelseacosmetics.com.au was penalised and didn’t recover to its previous state, even one year after the update. 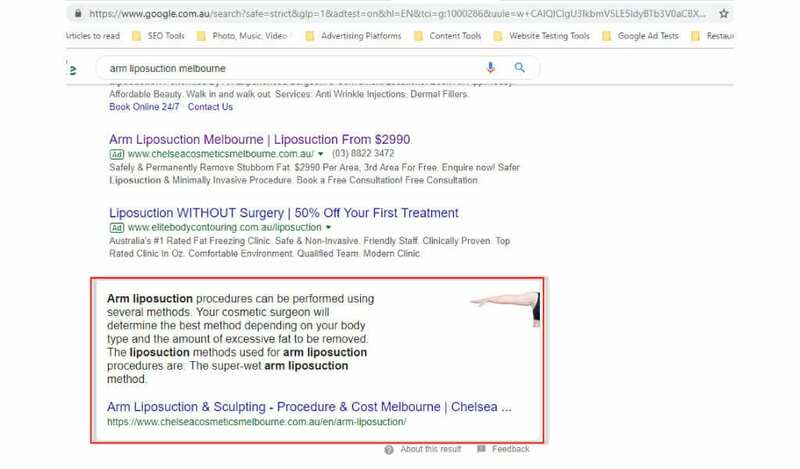 Dr. Attalla made an executive decision to start from scratch with a new website domain www.chelseacosmeticsmelbourne.com.au, to help his practice to return to higher search engine ranking results. Since then, Dr. Attalla had engaged with different Digital Marketing consultants to help rebuild the website; trying to do everything they can to boost the ranking and traffic. Despite spending a significant budget on digital marketing, he felt like the website wasn’t reaching its potential. 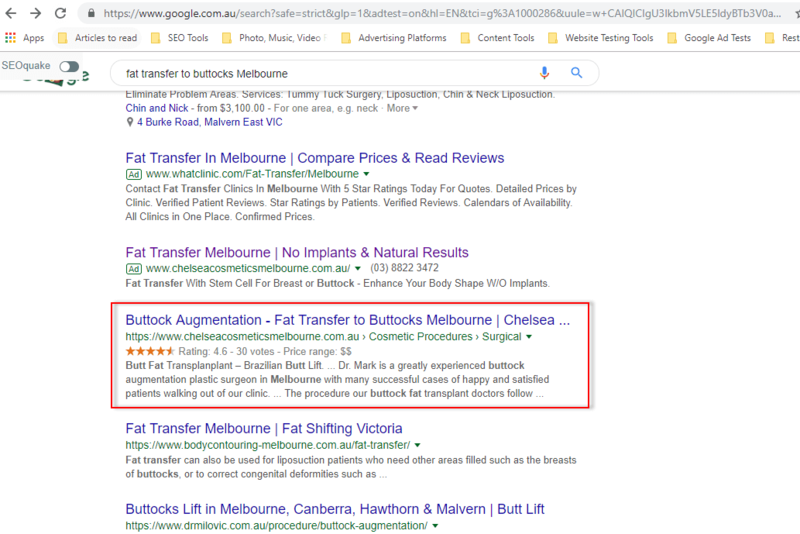 The ranking for the above-mentioned keywords were nowhere near the top of search results and the numbers of enquiries for their liposuction services were not significant. In March 2018, Dr. Attalla decided to search for a professional digital marketing consultant who had experience specifically within the medical industry and a proven track record in the cosmetic surgery sector. 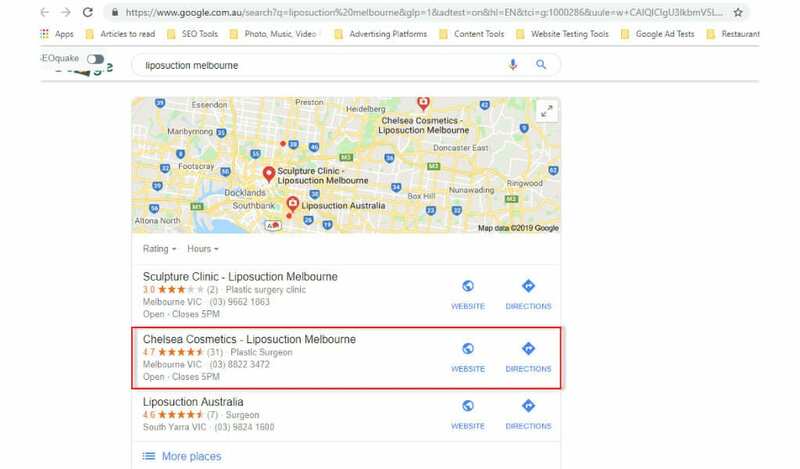 He reached out to Online Marketing For Doctors (OMD) team and after a thorough interview and background check, OMD team was commissioned to begin working on Chelsea Cosmetics Melbourne’s website. A 76% increase in monthly web traffic to Chelsea Cosmetic’s website. This was a critically important session that allowed us to set Chelsea Cosmetics Melbourne a clear direction for their online marketing activities, their use of resources, and to establish a clear pathway for them to reach their business goals. We sat down with Dr. Mark Attalla, and gained some fundamental information about the practice: target patients, key services, their niches, differences, strengths, weaknesses, threats and opportunities from the market, and we used this information to devise a custom online marketing strategy for his practice. Gaining an insight into what their competitors were doing and how their competitors operated, gave our team and the client an insight into the best direction for how to surpass them. One of the critical steps that other digital marketing agencies don’t do is to review and improve the website user experience and conversion rate. A highly functioning website is the cornerstone of all web marketing promotion and no matter how much good traffic is driven to a website, if it doesn’t convert well, all that effort will be for naught. Feature best-selling points of their procedures, and providing patients with more educational information such as videos, images and references to credible information source. 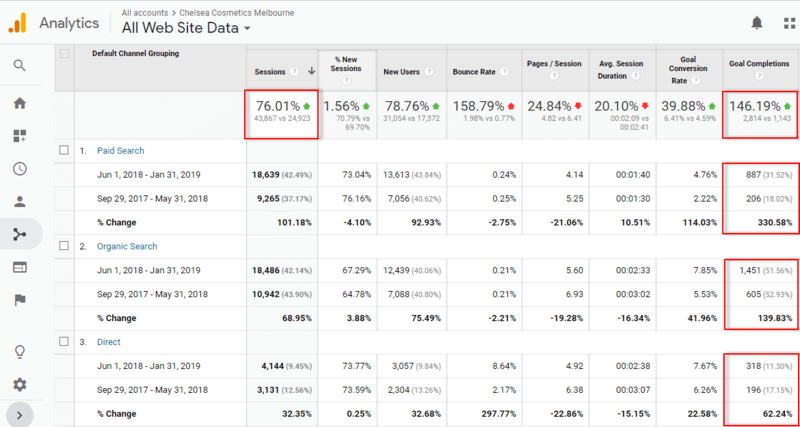 As a result, the updated website reduced the bounce rate, users were spending more time on the website, with more pages/visits, and most importantly there was an increased conversion rate from organic traffic, from 5.53% to 7.85% (41.96%) and for Paid traffic: 2.22% to 4.76% (114.03%). After conducting extensive research on the industry and Chelsea Cosmetics Melbourne’s biggest competitors, and also after interviewing Chelsea Cosmetics Melbourne themselves, we were able to identify their biggest strengths and value proposition, and the key points of difference from their competition. We then highlighted these key selling points on their website’s home page and subpages, to ensure that their targeted prospects would be able to view them easily from wherever they landed on the website. 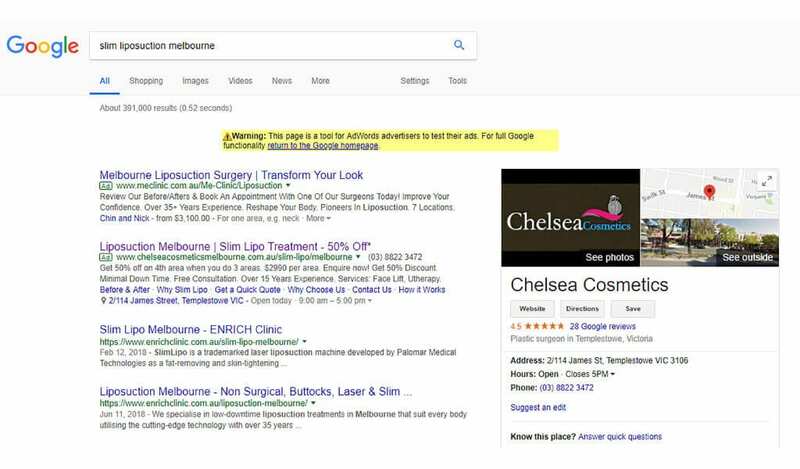 We extensively researched the appropriate keywords for all of the service pages on the website, conducting a comprehensive long-tail keyword research to find out which search terms that users were using to find information related to Chelsea Cosmetics’s main services. 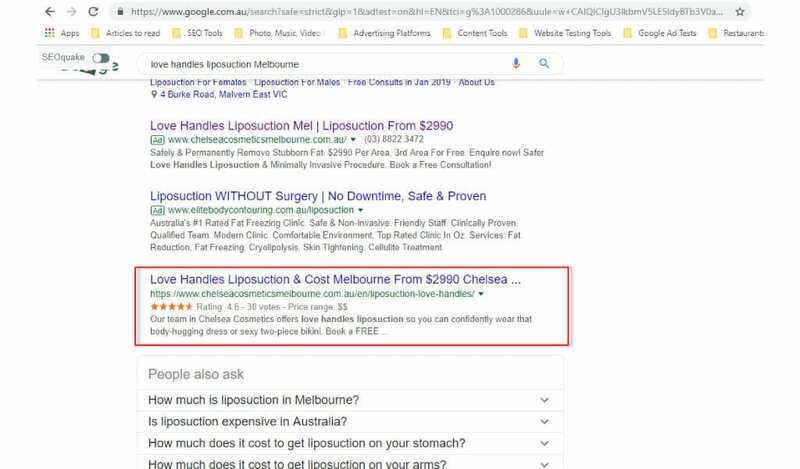 This comprehensive keyword research enabled us to devise a strategy to help Chelsea Cosmetics target all of the important suburbs in Melbourne. We also looked at the paid traffic data to determine the search queries that drive the most conversions for the website, and prioritised those keywords. The keyword research covered not only short-tail but long-tail keywords for blog content development. We gradually built more pages for the Chelsea Cosmetics Melbourne website, by adding highly specific niche service pages with unique content. A website with 100 pages has greater traffic potential than a 10-page website, simply because it offers more topics that users could be searching for. We also created a Chinese version of the website, attracting more Mandarin speaking patients to the practice. Writing benefit-driven copy that placed the user at the centre. Our goal was to create a website that users can quickly find the information they needed more easily. 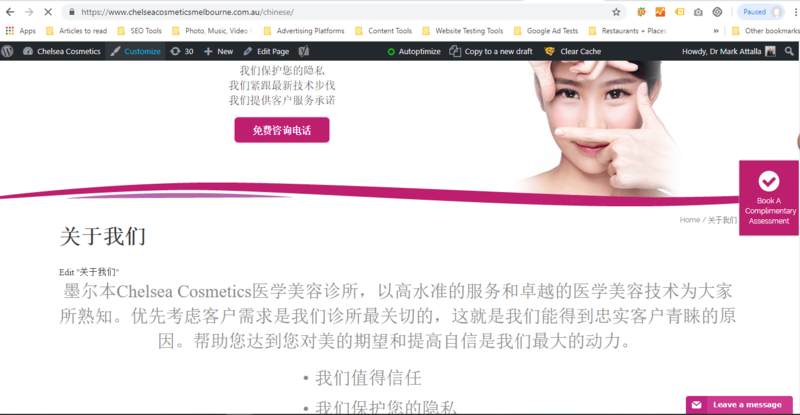 Ensuring Proper Indexation: Through the use of sitemaps, pagination, no-indexing tags and the reconciliation of all duplicate content, we were able to ensure the proper indexation of Chelsea Cosmetics Melbourne’s website. Individually crafted, uniquely written Meta Titles, Meta Descriptions, and Heading tags for all pages. By optimising the site’s title tags, meta description tags, heading tags and content to include targeted keywords, we were able to increase the Click Through Rate on search result listings and targeted search traffic. Improve the website’s loading speed for improved SEO on both desktop and mobile devices. This is one of the key elements to increase a website’s ranking performance. 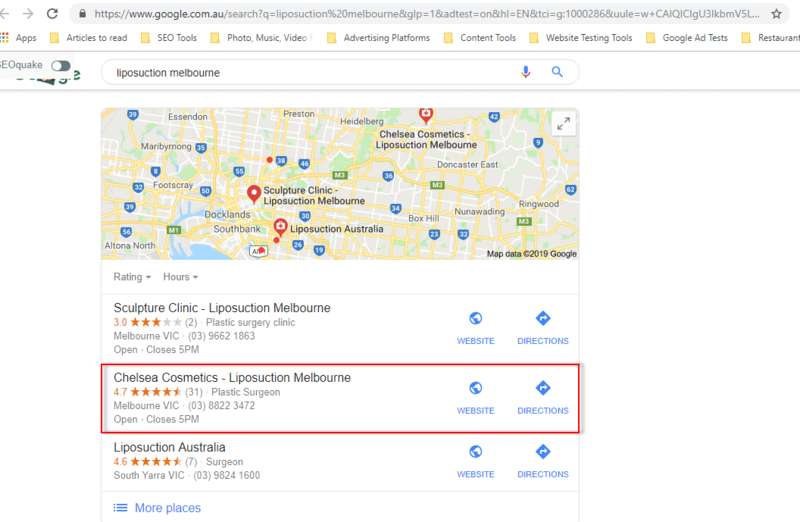 As part of our local SEO work, we assisted Chelsea Cosmetics Melbourne to reach out to their past and current patients, asking them for real testimonials for use on their website and to actively leave reviews on Chelsea Cosmetics Melbourne’s Google My Business listing account. We understand that businesses with a larger volume of positive reviews will start ranking higher than those with few or negative reviews. 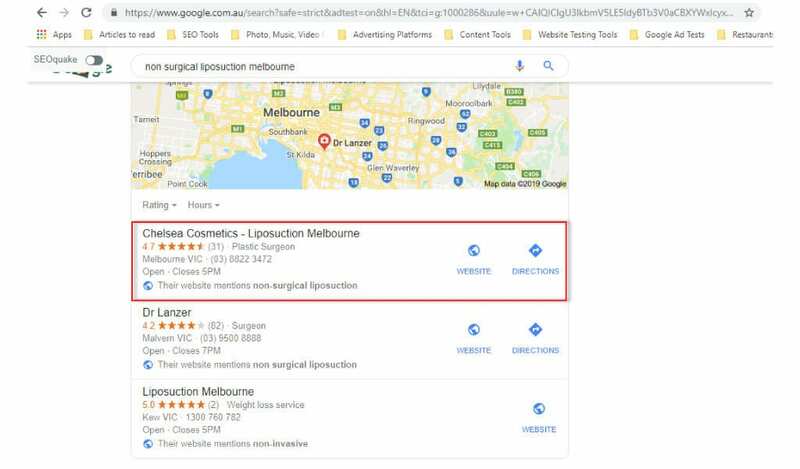 Increased referral traffic: Chelsea Cosmetics Melbourne is gaining referral traffic from not only their Google My Business listing but Facebook and other local and industry review sites as well. Greater brand authority: When people read great reviews about Chelsea Cosmetics Melbourne brand, they’ll be more likely to start with a better overall impression of Chelsea Cosmetics Melbourne’s practice, and more likely to spread the word to their friends and family. Gained critical feedback opportunities: Sometimes doing business isn’t perfect. In both positive and negative reviews of Chelsea Cosmetics Melbourne’s operations, Chelsea Cosmetics Melbourne has found critical pieces of feedback that they could learn from, to use and make their practice even better. Incoming links from other websites are a very important component of search engine optimisation. Poor quality links not only don’t increase your traffic or ranking, but they can also damage your domain and potentially attract a penalty from Google or other search engines if the site linked to it has violated any webmaster guidelines. Outreach to relevant blogs to feature Chelsea Cosmetics’s content and gain quality backlinks to the website. One of the main Paid Per Click advertising strategies we implemented was to build dedicated landing pages without any distractions focused on a single call to action. The landing page helped answer all possible questions that prospects might have, addressing their main pain points in a clear and organized manner. These new landing pages helped increase conversions by 115%. Figure 8: The effort to revamping landing pages helped increase the conversion rate from 2.22% to 4.78%, and the absolute number of conversions by 334.95% over the past 8 month period. This is the strategy that not many agencies may be aware of, that we’ve applied successfully for many clients, helping them to reduce their budgets by up to 100%, while doubling conversions; reducing the cost per acquisition significantly. 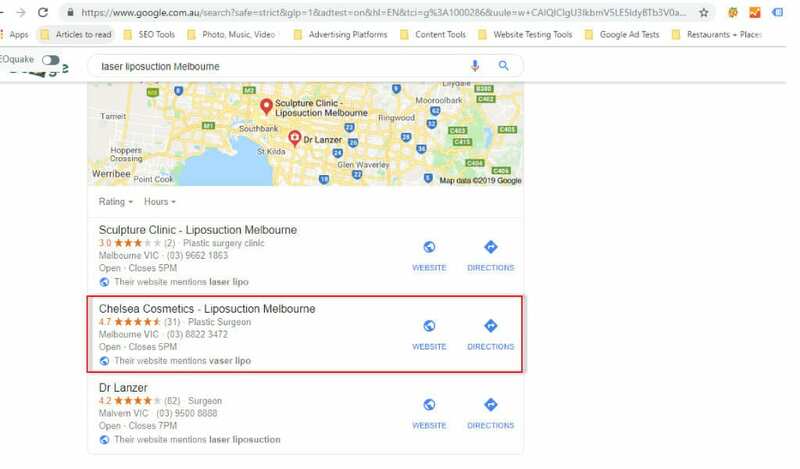 SKAG means Single Keyword Ad group Strategy – we only use one keyword or a very close variation of that keyword in an ad group, for example “liposuction Melbourne” and “liposuction in Melbourne”. This ensures that the ads copy is directly matching the users’ search queries, and increasing the ads click through rate. Another successful strategy we implemented was with bidding, and our negotiation process with Google which involves always starting with a lower than average low-range bid on a particular keyword’s cost per click and increasing it up overtime to the point that Google is willing to show the ads. 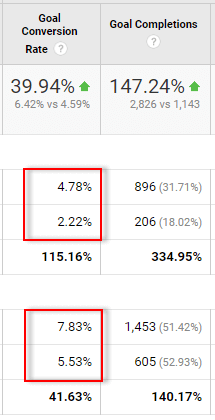 This helps make sure that we don’t overpay Google and together with the SKAG structure, we can control the CPC moving forward of the keyword very well, and know the exact real cost of a particular keyword. 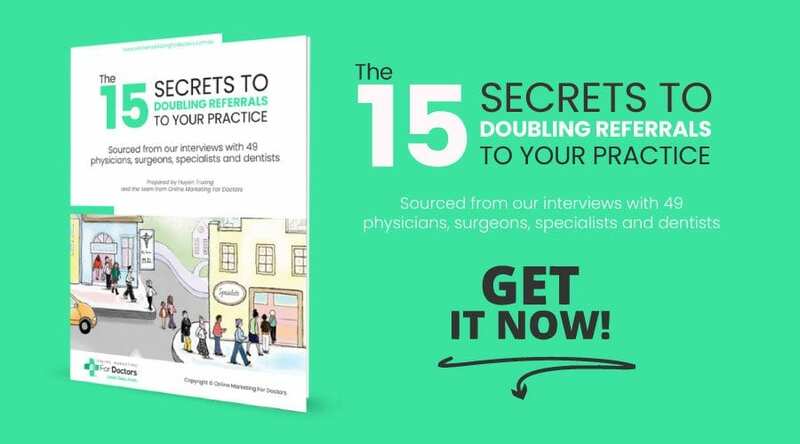 This little known strategy is a super-efficient tactic that once set up we use to help doctors get more patients through the door automatically. 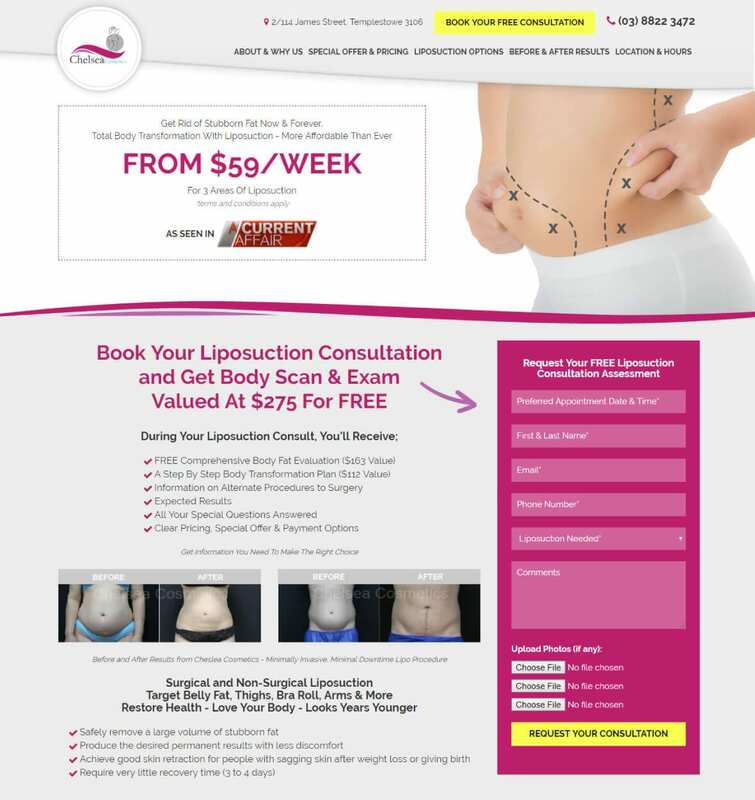 Webinars helped establish Dr Attalla as an authoritative specialist in the liposuction field, and through the webinar, prospects would be able to visually connect with the surgeon and get to know the surgeon before their consultation. Webinars are also a great opportunity to educate prospects and address any objections they may have prior to the in person consultation.